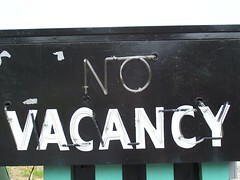 –No Vacancy–for putting off questions, discussions and decisions that are crying for attention. So, let’s flip it around. Let’s take down the No Vanancy Signs…and try “Welcome” or “Newly Envisioned” or “Ask Me” signs instead.